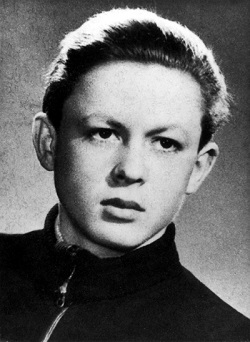 60 years ago today, Péter Mansfeld, the youngest victim of the 1956 revolution, was executed just 11 days after his 18th birthday. A teenage martyr and freedom fighter, Mansfeld later became an icon for his part in the revolution. Born in Budapest on 10 March 1941, Mansfeld attended school to be a turner in Csepel. While there, he learned to drive and managed to come in second in an industrial student competition. Mansfeld’s misery began, however, when his father and grandfather were taken away to labor camps in the Soviet Union, never to be seen again. At the time of the revolution, Mansfeld was only a teenager and joined the fight for independence at the ripe age of 16. He became part of the Széna square group of freedom fighters and quickly became known as one of the ‘Lads of Pest.’ The commander of the group, ‘Uncle Szabó,’ a 59-year-old truck driver and World War I corporal, initially sent Mansfeld away because of his age. However, thanks to his driving skills and courage, the boy later became a motorized courier, transporting medicine, ammunition and grenades for ‘Uncle Szabó’ and the group. After the Soviet intervention, Szabó was the first from the Széna square group to be sentenced to death. 76 other members received lengthy prison sentences and fourteen were executed, including Mansfeld. In 1958, he was first given a suspended sentence for theft. But, following his release, he formed a band (according to the communists’ charge: a ‘gangster band’) with some of his teenaged friends. 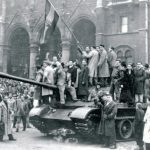 The gang of five stole several cars and weapons and managed to disarm a policeman at the Austrian Embassy before their capture on the 19th of February,1958. During his time in captivity, he showed incredible courage, even escaping temporarily. However, on 19 March 1959, the court determined that Mansfeld was one of the group’s ringleaders and sentenced him to death as a result. Most historians agree that the Communist regime used Mansfeld to convince the public that the revolution was merely a rebellion organized by criminals. In order to appear less cruel in the eyes of the world, the Communist regime waited until Mansfeld came of age to execute him. Therefore, Mansfeld spent the last year before his 18th birthday being tortured and waiting to be executed. The youngest victim of the reprisal, he was hanged on 21 March 1959, just 11 days after his 18th birthday. He later became an icon for his role in the revolution. these inspiring words are etched into the statue honoring Péter Mansfeld’s memory in a park in Buda’s second district. 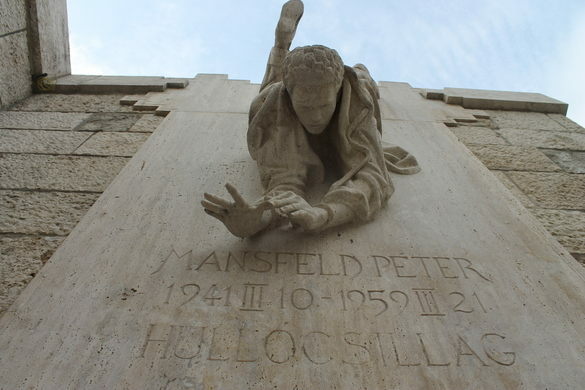 A statue, hidden in the first district, depicting a falling man also serves to commemorate the teenage martyr of the Hungarian Revolution. In honor of the 60th anniversary of Mansfeld’s execution, the Buda Castle Municipality will hold a commemoration and wreathing ceremony at the Péter Mansfeld statue in Szabó Ilonka street at 5 pm on Thursday, March 21.